Changes happenning to a person while the process of dying are of utmost interest. Evidence of people having suffered clinical death, religious experience – everything says that death is not the process of turning of alive intellectual substance to ashes, but the process of separation of mortal body and immortal soul. Whether it is possible to fix the process of separation of two substances – immortal soul and mortal body objectively, without relying on evidence of witnesses. Does it happen immediately, or the soul parts the body gradually? There are a set of questions which need demonstrative answers. Moreover, all these questions have fundamental, universal meaning, they determine, mainly, our attitude to the world and human’s place in it. 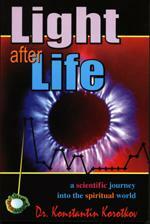 In this book, Dr. Korotkov gives answers to these questions.